Am I the last person to hear about this? 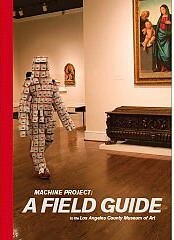 Apparently Echo Park’s Machine Project has put together a book on last year’s LACMA show. I guess the book release party was this past Saturday. If you can’t stop by their spot in Echo Park, you can buy a copy here. ~ by Valerie Palmer on December 8, 2009. This entry was posted on December 8, 2009 at 12:25 am and is filed under Uncategorized.You can follow any responses to this entry through the RSS 2.0 feed.You can leave a response, or trackback from your own site.